فیض‌‌آبادی, براتعلی, میرزایی, محمود, حسین‌‌زادۀ گویا, ناصر. (769). وابستگی شکل مغناطیس‌سپهر (مگنتوسفر) به مقاومت ویژۀ محیط در شبیه‌‌سازی‌های جهانی مگنتوهیدرودینامیک. مجله ژئوفیزیک ایران, 3(2), 12-24. براتعلی فیض‌‌آبادی; محمود میرزایی; ناصر حسین‌‌زادۀ گویا. "وابستگی شکل مغناطیس‌سپهر (مگنتوسفر) به مقاومت ویژۀ محیط در شبیه‌‌سازی‌های جهانی مگنتوهیدرودینامیک". مجله ژئوفیزیک ایران, 3, 2, 769, 12-24. فیض‌‌آبادی, براتعلی, میرزایی, محمود, حسین‌‌زادۀ گویا, ناصر. (769). 'وابستگی شکل مغناطیس‌سپهر (مگنتوسفر) به مقاومت ویژۀ محیط در شبیه‌‌سازی‌های جهانی مگنتوهیدرودینامیک', مجله ژئوفیزیک ایران, 3(2), pp. 12-24. فیض‌‌آبادی, براتعلی, میرزایی, محمود, حسین‌‌زادۀ گویا, ناصر. وابستگی شکل مغناطیس‌سپهر (مگنتوسفر) به مقاومت ویژۀ محیط در شبیه‌‌سازی‌های جهانی مگنتوهیدرودینامیک. 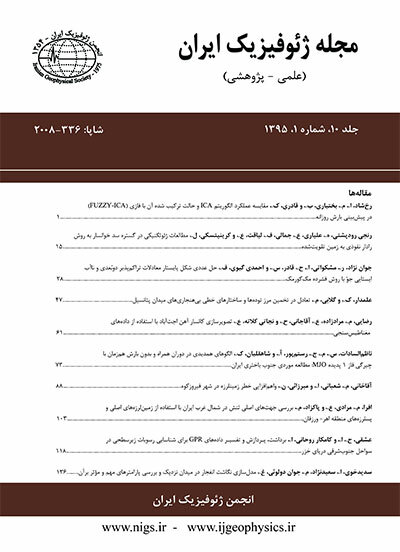 مجله ژئوفیزیک ایران, 769; 3(2): 12-24. برهم‌کنش میدان مغناطیسی زمین با باد خورشیدی منجر به پدیده‌‌های مهمی شده است. محدوده وسیعی از فرایندهای فیزیکی درسامانة باد خورشیدی– مغناطیس‌سپهر وجود دارند و درنتیجه طیفی از روش‌ها شامل بررسی‌های جامع پدیده‌‌های انتخابی با فرض یک هندسه میدان مشخص و با شرایط مرزی معین تا شبیه‌‌سازی کامل سه‌‌بُِعدی با فرض مگنتوهیدردینامیک برای بررسی آنها به‌کار رفته است. در این تحقیق روش شبیه‌سازی جهانی برای توصیف اتصال مجدد به کاررفته و این شبیه‌سازی در دستگاه بیضوی‌‌خورشیدی مرکز زمینی صورت گرفته است که در آن معادلات مگنتوهیدرودینامیک به شکل پایستار برای برهم‌کنش باد خورشیدی و مغناطیس‌سپهر حل شده است. برای آنکه تاثیر مقاومت ویژه روی مکان و زمانِ پدیدۀ اتصال مجدد بررسی شود، شبیه‌‌سازی با انتخاب مقاومت‌‌های ویژه متفاوت صورت گرفته است. نتایج حاصل از شبیه‌‌سازی نشان می‌‌دهد که مکان و زمان اتصال مجدد مغناطیسی بستگی زیادی به مقاومت‌‌های ویژه انتخاب شده، به‌ویژه 001/0 اهم‌‌متر دارد. شکل‌‌های رسم شده برای مقاومت ویژه کمتر از 0001/0 و بزرگ‌تر از 01/0 اهم‌‌‌متر نشان می‌‌دهند که گویی شکل مغناطیس‌سپهر هیچ‌‌گونه تاثیری از برهم‌کنش بین باد خورشیدی و مغناطیس‌سپهر نداشته است و لذا هیچ اتصال مجددی نیز به وقوع نمی‌‌پیوندد. براساس نتایج به‌دست آمده از این تحقیق پیشنهاد می‌‌شود که همرفتیِ جهانیِ مرتبط با اتصال مجدد می‌‌تواند با محاسبۀ انتقال انرژی، جرم یا میدان مغناطیسی روی مرزهای مناطق خطوط باز و بستۀ میدان براساس الگوهای مقاومتی متفاوت، صورت‌‌ گیرد. در این تحقیق همچنین مقادیر متفاوت مقاومت ویژه برای عملی ساختن شبیه‌سازی آزمایش شده و الگوی بهینه تحت شرایط اولیۀ معین، مشخص شده است. نتیجه این تحقیق که تعیین دقیق چگونگی شکل‌‌گیری پدیدۀ اتصال مجدد است، می‌‌تواند نقش مهمی در آسیب‌‌شناسی پدیده‌‌های هوافضایی داشته باشد. The interaction of the solar wind with the Earth’s magnetic field gives rise to a number of important phenomena. These include reconnection between the solar wind magnetic field and geomagnetic field lines, reconnection in the magnetotail, plasma convection in the magnetosphere/ionosphere, generation of a field-aligned current system, and energetic particle injection. A wide range of physical process is involved in the solar wind-magnetosphere system, and consequently a wide array of methods has been used to study them, ranging from detailed studies of selected phenomena with the assumption of a specific field geometry or boundary condition, to fully three-dimensional simulation with a Magneto-hydrodynamics (MHD) assumption. Almost fifty years ago, was proven that the magnetic field lines could be broken and then reconnected with other magnetic lines, a process that is called magnetic reconnection. After that time, the concept of magnetic reconnection found important applications in space studies to provide the safety conditions for satellites and spacecrafts for the first time in 1961 this concept was applied to the geomagnetosphere and used to express the basic model for magnetospheric convection that happens on magnetopause and magnetotail during magnetic reconnection. Also in 1964, the first quantitative model of magnetic reconnection regarding solar flares was developed and introduced in a model that could describe the fast rate of energy release in solar ejections. The conventional definition of magnetic reconnection indicates that the phenomena occurs on the electric field parallel with the X-Line, however, for many reasons there has been a problem in modeling Magnetohydrodynamic simulations: It is possible that determining the X-Line accurately in irregular magnetopause is very difficult or impossible due to the lack of an unknown real resistivity model, which prevents the establishment of a reliable non-convectional electric field. The simulation of MHD was performed in a Geocentric Solar Ecliptic coordinate system and with magneto- hydrodynamics equations in steady state form to quantify interaction between solar wind and magnetosphere. Simulation space included an area with dimensions of 90×60×60 times of earth radius (Re), for which the spatial and time steps for modeling were chosen as 0.5 Re and 0.937 s, respectively. Cells which construct the model for simulation were 326000 in number. A magnetic dipole in the origin and electrostatic equations for ionosphere were considered. To investigate the effect of resistivity on the place and time of magnetic reconnection, simulation was executed with consideration of different resistivity values. The results of the performed simulations showed that the place and time of magnetic reconnection depend largely on the variations of resistivity selected for the modeling, especially at the level of 0.0001 Ohm-m. Figures plotted from the simulation results formed with resistivities of less than 0.00001 and greater than 0.01 Ohm-m depicted the shape of the magnetosphere such that interaction between solar wind and the magnetosphere field appear not to have occurred or created any reconnection. Generally speaking, this study applied the global MHD simulation to describe the magnetic reconnection. It has been proposed that the global convection related to magnetic reconnection can be determined by a calculation the energy, mass, or magnetic field transfer on open– closed field line boundaries based on different resistivities models. This study also examined the different values of specific resistivity for running simulations and determined the optimum model under known initial conditions.